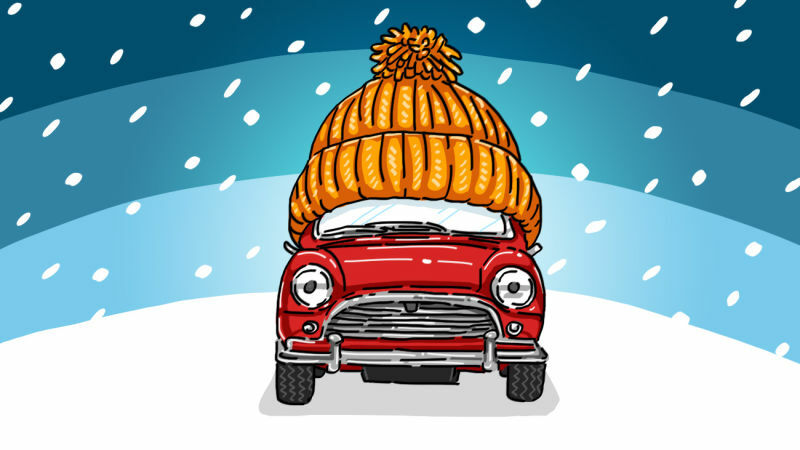 Did you know that in 2016, 42% of all car accidents for that year occurred during the winter months alone?! If you have ever driven on an icy road, you know for a fact what difference winter tires make. But is that the only measure you can take to avoid being in an accident this winter? The answer is no. While we believe that winter tires are very important (click here to read why), there are other things which you can also do to prepare your vehicle. We have compiled a list of 7 tips to help you keep your vehicle in top-notch condition this winter. Make sure you check your wiper blades. Wiper blades usually have a lifespan of a year, however, it is always recommended to get a new pair for the winter months. If your vehicle doesn’t have the newer beam-blade style wipers, consider getting a pair – they do not have an external spring to freeze up, which makes them ideal for the subzero temperatures. Batteries have a harder time operating during the winter months than they do during the summer. As a result, a battery which is already weak during the summer could turn into a dead battery as soon as the temperatures drop. But how do you know if your battery needs to be replaced?! A simple volt test will do the trick – if you find that your battery is going south, you can replace it at your earliest convenience, instead of being at the mercy of whatever shop your vehicle is being towed to. We put antifreeze in our cars for two reasons – one is to keep the engine from overheating and the other is to protect the engine block from cracking during extreme cold. Ensuring you have accurate levels of antifreeze in your engine during the cold months ahead will definitely save you some headaches down the road. Did you know that tires lose a pound of pressure every time the temperature drops by 10oF?! Having your tires are at optimal pressure at all times will not only ensure that the tires are able to “bite” through snow down to the pavement but it will also increase the fuel efficiency of your vehicle. It is recommended to check your tire pressure at least once per month. If you are thinking that this is an unnecessary little detail, then you need to think again. Did you know that the slippery surface which results after waxing the lights makes it less likely for an icy coat to build up on them? This not only makes it easier and quicker for you to clear your car after a night-long snow storm but it also makes your vehicle more visible to other drivers. And the best part is – it will take you less than 15 minutes to do! And while we are on this topic, make sure all your signaling lights are functioning properly – these include the indicators, brake lights, headlights and taillights. If you have ever driven behind somebody on a wet winter road, you will know what we mean. On such days, windshields get dirty very quickly and before you know it, you’ve run out of windshield fluid. Make sure you top it up regularly and have an extra jug at hand, in case you run out. This is our last tip, but it is also the most important one. With all the car-accidents and unexpected repairs which come up during this season, service shops are always busy during the winter. Save yourself some wait time and get your vehicle serviced now. Getting your tires rotated, your oil changed and that check-engine light taken care off will definitely help your vehicle perform at its best during the cold months. Our highly-qualified and super friendly technicians are always happy to provide you with exceptional service in a timely manner. From oil changes to transmission replacements, they are dedicated to maintaining top-tier customer service. Allow them to demonstrate our commitment to excellence – give them a call at (613) 736-9022 or directly book your appointment at: http://www.janexauto.com/service/ .